As one of the essential furniture pieces in your office, a chair needs to fit your body perfectly so as to ensure that you feel comfortable even while sitting in it for hours on end. The quality of craftsmanship and the comfort it can provide you are two important aspects, without a doubt. But that doesn’t mean that your next chair also has to be ugly in order to be comfortable. Getting the perfect balance between great looks and amazing functionality is attainable. Check out our selection below. Back problems are an issue for the long and short-term. And it is essential to have a chair that is built in accordance with the physiology the physiology of the back and doesn’t damage your spine. And this model fro Flash is specially designed with that in mind. The product has a contemporary feel to it and could be an ideal office chair since it’s intended to put up with daily use. The high back will take care of your spine, and the built-in lumbar support will take that even further. Some extra features of the leather item are the tilt tension adjustment knob, the tilt lock mechanism and the pneumatic adjustment lever to chose your desired height. A good chair can make you do your work faster and even the most extended tasks a breeze. And this one can help you have that without any compromises. The piece of furniture features a pillow designed for your neck, that is comfortable and soft so you won’t have to feel your muscles sore after a hard day at work. The body of the product is stuffed with plush pillows, in layers, that will make your body feel light and relaxed. And the pneumatic seat-height adjustment will allow you to choose the height you desire. And it even comes with a waterfall seat edge that takes the pressure off the back of your legs. 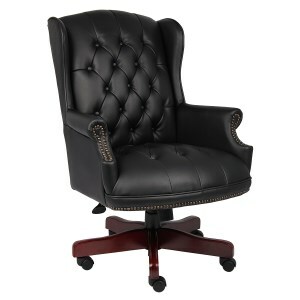 This faux leather chair looks good and has a classy feel to it that will make sitting a unique experience every time. The contemporary design is complemented by the slim profile and the small footprint. The waterfall seat edge helps the back of your legs by reducing the pressure, and the padded armrests add a plus of comfort and enjoyment. The faux leather is environmentally friendly, and the white color it comes in is stain resistant and easily washable, and it doesn’t wear off even if you use it a long time. Add to that the steel frame and you have a premium product. If you are a dedicated gamer, then you need an ergonomic chair that will make you feel comfortable, and it will help you win a lot of games. This black and yellow PU leather model looks and feels good. 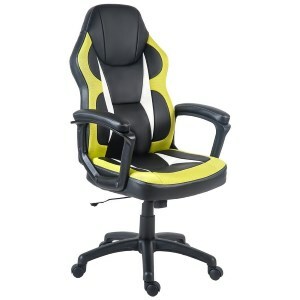 The materials are resistant to friction since gamers move in the chair a lot and the colors won’t fade in time. It offers excellent back support, and the breathable material helps with seating and bad smells. You can adjust the height, so it fits your desk, and it even has a 360-degree swivel and multi-direction wheels so you can move it around without too much of a bother. This product has a unique design that makes it not only useful but a piece of decoration that will entertain your guests, too. It is classy and premium and features a gas lever for adjustable height that makes such modifications easy and without having the mechanism break as it sometimes does with other types. It comes with omnidirectional wheels for moving around quickly and a comfortably, and boasts a high-quality seat that will make you want to sit in it all the time. It is sturdy and good looking and an ideal choice for anyone who wants a statement-piece and not just something that works. A chair with a classic design will never go out of style. And matched by equally classic colors like black and brown, this piece can make a great addition to a library or an office. This traditional chair has a mahogany wood finish on components that are all made of wood and hand-applied nailhead trim that gives it a fresh, somber look. It’s not only a pleasure to look at, but it’s also high-quality and very useful especially paired with the study wheels. 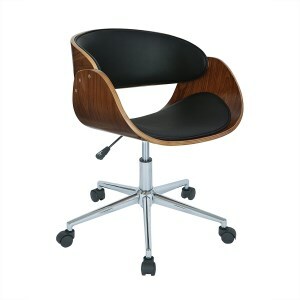 The vinyl the chair is covered in is resistant to stain and sweat, and the model overall is soft and comfortable to sit on. An option with a quirky design can be the missing piece from your home. It offers excellent value for its money since it can act as a one and as a focal point in a room. This product from Porthos is the desired combination of style and comfort. It can rotate 360 degrees, and it has an adjustable height to fit your body type. The bentwood frame adds a touch of coolness, and the comfortable upholstery will make you forget you sit on a sturdy chair. Talking about sturdy, the framework of this product can take any load, and it won’t bend, making this item perfect for daily use. This ergonomic chair can make the difference between a successful day at work and one filled with back and neck pain. Due to its unique ergonomic design, the model will take care of your spine and will look good while doing it. The skeletal frame of the back is covered with a mesh that takes strength to a whole new level. It purposely allows air to circulate and it helps prevent back sweating. 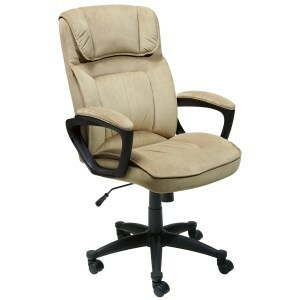 It has an adjustable armrest that is ultra soft, and it can be adjusted just by pushing a button. The frame is sturdy and so are the wheels, making this product a joy to use. This sleek chair will help fulfill all your tasks without the pain associated with using a chair for a long time. The most important thing about this product is that it’s comfortable and a pleasure to use since you can adjust the height and the angle, so it fits your needs. And the lumbar support brings some extra health benefits when it comes to extended use. It rocks a breathable mesh for air circulation and to keep you sweat-free. And another great thing about this product is that it is easy to install if you follow the provided instructions the chair comes with. We spend most of our adult lives locked in cubicles or personal offices, working in front of a desk and a monitor. And while we do our best to perform well and receive bonuses and big paychecks at the end of the month, in between the working hours we often forget about comfort and rest. One of the most important accessories when it comes to working well and comfortably is the chair we sit on. Thus, choosing a cool office chair which will both look good and make you feel good should become a priority whether you are an employer or an employee. Since we spend most of our days sitting on a chair, an uncomfortable one could cause plenty of health problems in the future. However, since there are so many options available on the market, choosing the perfect one for each employee may seem like a difficult, if not impossible task. Our team of specialists has compiled a list of things to take into account whenever shopping for such office chairs with the hope that they will help you better decide upon the best choice. There are endless supplies of cool office chairs available for purchase, but not all offer the required back support in order to reduce back pains and future health problems. Moreover, some of them, although accessible in terms of price, provide poor sustainability and ergonomics, and can even endanger the wellbeing of the users. 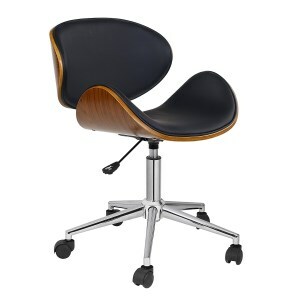 Whenever shopping for a good office chair you need to take various aspects into account, amongst which the following. The fabrics used to create an office chair are of extreme importance, no matter which type of item you use. There are mainly three types of fabrics used for chairs – polyurethane or PU, commonly known as faux leather, real leather, and textile fibers. 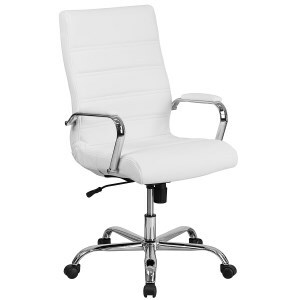 Faux leather is the most common fabric for office chairs. It looks luxurious and mainly offers a good back support while coming in a wide array of colors to best suit your office and surrounding spaces. It is quite resistant and durable and still comes at an affordable price. These qualities make polyurethane the number one choice for all office chairs, although it may not be the best one. On the other hand, real leather is ten times more expensive, but will definitely last you a lifetime. Unlike faux leather, the real leather chairs are more resistant to friction, hard action, and direct sunlight. Real leather is thicker than PU, but buying real leather office chairs is a huge investment, especially if we are talking about numerous employees. Often enough, this type of chairs comes with a staggering price tag of over two thousand dollars. Similar to PU, these chairs can also provide perfect back support and prevent lower back problems, while also offering a stylish, luxurious and colorful design. 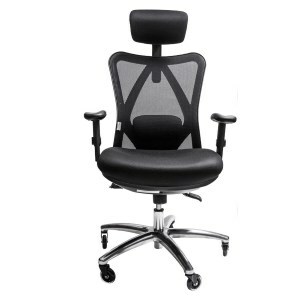 Textile fabric office chairs are, by far, the most affordable choice. They are also extremely flexible but this means that they won’t provide enough lower back support. They are not meant for daily use and multiple hours because the user’s back is not properly sustained and, in time, they might lead to the occurrence of back problems and various bone-related issues. However, apart from the convenient price, textile fabric chairs occupy less space than the PU and real leather ones, meaning they can make for a great solution in small and crowded spaces. 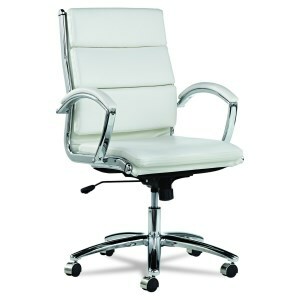 The size of the chair is also extremely important whenever searching for a good office item. 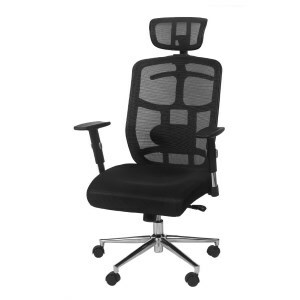 Although they occupy much space and have a bulkier construction, full back office chairs offer the best back and neck support, especially during long hours of work. In other words, office chairs with taller back parts which completely cover a person’s body are preferred because they will provide the required back support and will reduce back pains and fatigue. It is important to opt for a chair which matches the size of your body and offers full back support, no matter how tall you are. If you’re taller than the average, we suggest opting for specific chair manufacturing brands which offer a wide selection of office chairs for tall people. Such items come covered in the softest brown leather and provide a fully adjustable lumbar support mechanism, as well as an ergonomic tilt system. These products come with reinforced structures, specifically designed for tall and heavy individuals who have a hard time finding a chair according to their size. Such chairs can support weights of up to 350 pounds, while the enlarged seat is fully cushioned in the softest leather to offer maximum elegance and comfort. As for the structure, we do suggest opting for metal structures instead of hard plastic ones, for all the obvious reasons. Hard plastic structures are rigid but don’t support too much weight, meaning they are more prone to break after a short period of time. On the other hand, although bulkier and heavier, metal-structured office chairs will diminish back problems and support larger weights. Fabrics and structure are the main important elements when looking for a good office chair, but so is the ultimate shape of the item. As previously mentioned, you will want bulkier, steadier designs if you truly want to deliver comfort to your employees. 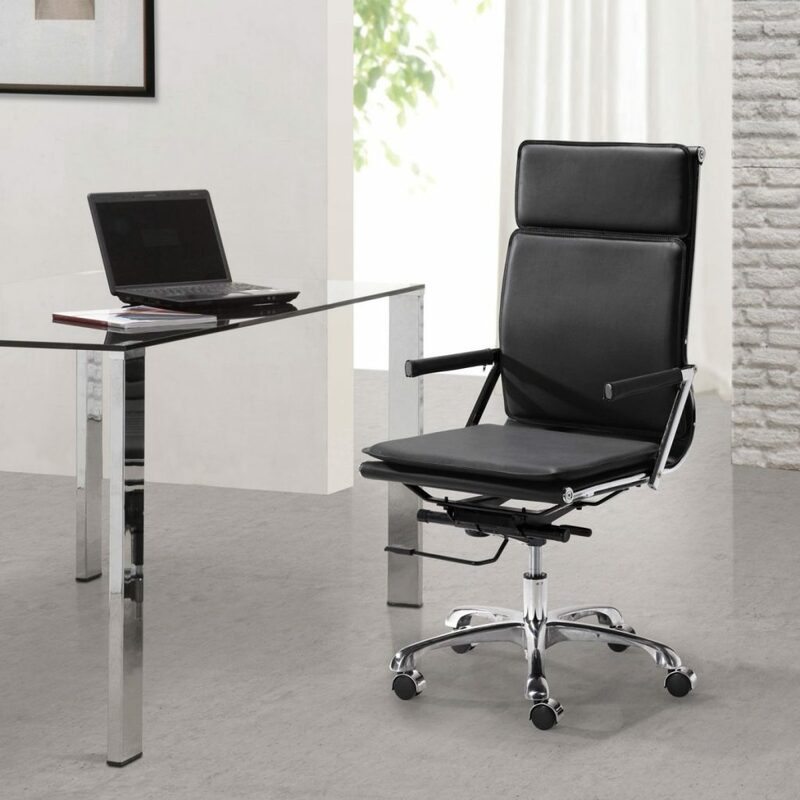 We suggest opting for ergonomic chairs, made out of PU because they are specially designed to closely follow the lines of the human body and they manage to deliver an ultimate back support for comfortable sitting and resting, even during long office hours. One of our top choices includes a recliner chair which offers a versatile and useful design for those who spend more time at the office than inside their own homes. The product is fully convertible and can transform into a comfortable nap time recliner whenever you need to relax for a few minutes. It also comes with leg support and armrests for added comfort.